The telecommunications team is part of the Network group within the Information Systems & Technology department. 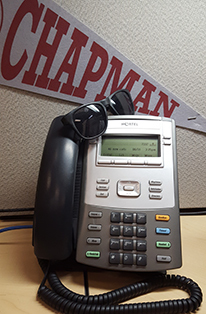 We provide telephone and cable infrastructure support for faculty and staff at Chapman University. We also provide telephone and cable infrastructure support for Residential Living, for example Panther Village and the on-campus housing located off Walnut Avenue. Local calling is provided. For long distance calls, a calling card is needed. If you have a request or need assistance please open a ticket through the Service Desk.